The Second Article: Fishing Expedition or Systematic Investigation? 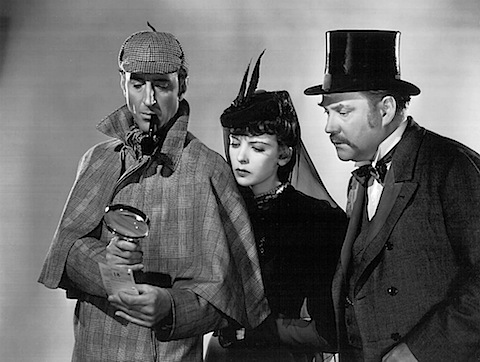 Basil Rathbone as Sherlock Holmes. II. RESPONDENT COMMITTED CULPABLE VIOLATION OF THE CONSTITUTION AND/OR BETRAYED THE PUBLIC TRUST WHEN HE FAILED TO DISCLOSE TO THE PUBLIC HIS STATEMENT OF ASSETS, LIABILITIES, AND NET WORTH AS REQUIRED UNDER SEC. 17, ART. XI OF THE 1987 CONSTITUTION. Last week, the defense and the prosecution hotly debated what constitutes the actual charge. The defense argues only the part in bold is the charge. The prosecution argues II, 2.1, 2.2., 2.3. and 2.4 constitutes the charge. In layman’s language, the defense argues that the header is the charge; the prosecution maintains the header is simply that, the header, and that the entire Article is the charge. Defense, in the person of Justice Cuevas, argues that in criminal cases, you cannot go beyond what is mentioned in the actual charge (hence his insistence, all along, that impeachment is closer to a criminal case, even though it is not an actual criminal case), and the Senate President has given signs that he is inclined to think so, too, but has carefully avoid having to make a ruling to that effect. For what determines the nature of the action and which court has jurisdiction over it are the allegations in the complaint and the character of the relief sought. The cause of action in a complaint is not determined by the designation given to it by the parties. The allegations in the body of the complaint define or describe it. The designation or caption is not controlling more than the allegations in the complaint. It is not even an indispensable part of the complaint. It is the allegations in the body of the petition that control and not the heading or caption. It is true that both the complaints as well as the information, in their caption, merely designate the crime charged as that of “Acts of Lasciviousness”, but such designation is not controlling. It is a mere conclusion of law. The factor that characterizes the charge is the actual recital of the facts. That, it was held that, “The crime of which the defendant stands accused is that described by the facts stated in the information, and not that designated by the fiscal in the preamble thereof … The designation of the crime by name in the caption of the information is a conclusion of law on the part of the fiscal,… It is not necessary, for the protection of the substantial rights of the accused, nor the effective preparation of his defense, that he be informed of the technical name of the crime of which he stands charged. He must look to the facts alleged.” (Emphasis supplied) (U. S. vs. Lim San, 17 Phil., 275) It is evident that the lower court did not err in finding the accused guilty of the crime of trespass to dwelling. What do these three extracts tell us? That when it comes to charges, headings or the captions used do not dictate the charge: nor does the charge consist merely of the specification of the crime committed, or the law that was allegedly broken; it consist of the whole kit and caboodle: heading, crimes alleged, and facts enumerated. Now apparently there are two categories of facts to be considered. “Evidentiary facts” are those which are necessary to prove the ultimate fact or which furnish evidence of the existence of some other facts. They are not proper as allegations in the pleadings as they may only result in confusing the statement of the cause of action or the defense. They are not necessary therefor, and their exposition is actually premature as such facts must be found and drawn from testimonial and other evidence. In layman’s terms, culled and paraphrased from Ricardo J. Francisco’s Evidence: Rules of Court in the Philippines Rules 128-134 Third ed. 1996. Ultimate facts: Those which one must prove in order to establish his claim. In an impeachment, they would be the grounds for your complaint. evidentiary facts: Those relevant facts that substantiate your claim. Now the question of the kinds of facts required for a charge to be valid, forms what seems to be the second line of argument of the defense. Look at items (or paragraphs) 2.3 and 2.4 of Article II. What do these items do? They inform the Chief Justice that he is accused of having accumulated ill-gotten wealth, acquiring assets of high values and keeping bank accounts with huge deposits. An example was even given —among others— the so-called “posh” condo unit it Taguig. Article II also accuses the Chief Justice of violating the Anti-graft and Corrupt Practices Act. The prosecution can argue that the allegations are clear and that the Senate, by providing the Chief Justice with a copy of the Articles of Impeachment, and asking him to respond before the trial started, made sure that the Chief Justice was properly informed of the accusations against him: he was provided with the ultimate facts. THE PRESIDING OFFICER. If that is included, anyway, that is an admission on the part of the Chief Justice that he owns that apartment. We are not talking of offer of proof yet, no. But I am just saying this. So, as far as this Chair is concerned, and as far as the 300 square meter plus apartment is concerned, I think any question regarding this is proper. But with respect to the acquisition of assets of high value, and the existence of bank accounts, I agree with you that would be a questionable allegation. So, we will deal with that when the offer of proof is reached. At the moment, we are just talking about the documents that were subpoenaed. THE PRESIDING OFFICER. In fact, there is an admission against the interest made by the Chief Justice on this because he admitted publicly that he owned. JUSTICE CUEVAS. Yes, Your Honor. In fact, if Your Honor will remember, with the kind indulgence of the honourable court, we even made that a part of our evidence, Your Honor. But, the purpose is not to prove that he acquired it but that he had complied with the requirements of law relative to the filing and submission of SALN. Nothing more. Not on the issue of ill-gotten wealth. Just to make my point clear, Your Honor. THE PRESIDING OFFICER. Correct. Correct. I agree, Mr. Counsel. I agree with you that you can register you continuing objection to any introduction of evidence with respect to ill-gotten wealth and with respect to the existence of huge amounts of money in the bank. But whether we will admit those evidence when they are offered, during the period of offer of evidence, is something else. JUSTICE CUEVAS. May I now be allowed to … with your indulgence, Your Honor. Besides, the witness now is not here only on the issue of subpoena ad testifcandum. Also to testify .. if the honourable Chairman will notice, I made him read the order for him to appear, not merely to bring the documents stated in there, described in there, but to testify. And since this will involve testimonial evidence, our law on procedure and evidence states the moment it is testimonial evidence, right at the first time the witness takes the stand, the offer is being made. THE PRESIDING OFFICER. Then you can object to any reference to ill-gotten wealth and the Chair will make a ruling. JUSTICE CUEVAS. Thank you, Your Honor. I was about to raise that, Your Honor, at the start, but fearful of the apprehension that may be generated, that we are delaying the proceeding, we have chosen to keep silent on that particular issue. Thank you very much, Your Honor. REP. BARZAGA. Your Honor, may the prosecution respond. REP. BARZAGA. Well, Your Honor, it has been always the consistent position of the defense that there is no allegation of ultimate facts. And I read paragraph 2.3, Your Honor, in our complaint. It is also reported that some of the properties of respondent are not included in his declaration of his assets, liabilities and net worth in violation of the Anti-Graft and Corrupt Practices Act. For us, this is already the ultimate fact. If the counsel for the defense requires us to state the properties which were acquired in violation of the Anti-Graft and Corrupt Practices Act, then the enumeration of these properties would be considered as evidentiary fact. Second, in paragraph 2.4, it is also provided that respondent is likewise suspected and accused of having accumulated ill-gotten wealth, acquiring assets of high values and keeping bank accounts with huge deposits. That is also an ultimate fact. If the counsel for the defendant would like us to state in the complaint the specific accumulated ill-gotten wealth, the assets of high values as well as the bank accounts, then that would be also an evidentiary fact. And we have also to consider that insofar as this impeachment case is concerned, there are three pleadings which are already on the record of this impeachment court. The number one is the complaint. I have expressly read the pertinent provisions and the second pleading happens to be the answer of the respondent. And what is stated in the answer of the respondent? In paragraphs 2.3 and 2.4 in their answer, they stated complainant suspect and accused Corona of betrayal of public trust because he allegedly accumulated ill-gotten wealth, acquired high value assets and kept bank deposits with huge deposits not declared in SALN. Paragraph 11. THE PRESIDING OFFICER. Wait a minute. Was there an admission in the answer with respect to this supposed allegation? REP. BARZAGA. I will state, Your Honor please. In the last sentence of paragraph 11 of their answer and I quote: “At any rate, the allegations are flatly denied.” The truth of the matter is that CJ Corona acquired his assets from legitimate sources of income mostly from his professional toils. And let me state also what has been stated in our reply. In our reply, page 25, paragraph 53.1, the complainants reserve the right to present evidence during trial on other expensive properties acquired by Corona and his family. And, therefore, insofar as the law on pleadings is concerned, ill-gotten wealth is already an issue which has been joined as stated in the paragraphs which I have quoted in the complaint as well as the answer and as well as the reply. And, therefore, we think that the contention that there has been no allegation of ultimate facts is entirely erroneous inasmuch as the ultimate facts have already mentioned and also it has been flatly denied in the answer. THE PRESIDING OFFICER. Anyway, are you through? REP. BARZAGA. Yes, Your Honor. 11. The allegations are conjectural and speculative. They do not amount to a concrete statement of fact that might require a denial. Accusations in general terms such as these have no place in pleadings, as they bring only hearsay and rumor into the body of evidence involved. At any rate, the allegations are flatly denied. The truth of the matter is that CJ Corona acquired his assets from legitimate sources of income, mostly from his professional toils. This answer actually does two things. It refuses to recognize the validity of the charges. But it also provides an answer to the charges. And since it does two things, there could be two responses to the two arguments. Thus, in the case of Abe vs. Foster Wheeler Corp., L-14785, Nov. 29, 1960, it was held that a complaint must contain ultimate facts constituting plaintiff’s cause of action. A complaint would be sufficient if it contains sufficient notice of the cause of action even though the allegations may be vague or indefinite, in which event, the proper recourse would be, not a motion to dismiss, but a motion for a bill of particulars. If petitioners perceive some ambiguity or vagueness therein, the remedy is not a motion to dismiss. An action should not be dismissed upon a mere ambiguity, indefiniteness or uncertainty, for these are not grounds for a motion to dismiss, but rather for a bill of particulars. WHAT IS THE PURPOSE OF A BILL OF PARTICULARS? WHEN CAN AN ACCUSED MOVE FOR A BILL OF PARTICULARS? WHAT SHOULD BE CONTAINED IN THE MOTION FOR A BILL OF PARTICULARS? But the thing is, the Chief Justice did not file a Motion for a Bill of Particulars. So he lost his chance. Instead, the Chief Justice actually answered the charges –recall his answer: “At any rate, the allegations are flatly denied. The truth of the matter is that CJ Corona acquired his assets from legitimate sources of income, mostly from his professional toils”– so it clearly indicates he knew what he was being charged with, and grasped the bull by the horns, so to speak, by directly refuting the charges. JUSTICE CUEVAS. Thank you, Your Honor. THE PRESIDING OFFICER. Will you kindly allow the Chair to say something. My understanding of the Rules is that, when a testimony is offered, the objectionable feature must be seasonably addressed by the opposing counsel in order that the objection can be recorded, so that the given this Rule, the Chair will allow the witness to answer questions with respect to the properties mentioned, subject to the continuing objection of the counsel for the defense with respect to the application of all of these questions in proving the issue of ill-gotten wealth, acquisition of assets of high value and accumulates keeping bank accounts with huge deposits, as well as some properties of the respondent not included in the SALN, because the proof of non-inclusion will be the document, the SALN. THE PRESIDING OFFICER. Yes, please. Proceed. THE PRESIDING OFFICER. Maybe some of your students were absent when you were lecturing on this point of law. JUSTICE CUEVAS. I hope not, Your Honor. REP. BARZAGA. May I just make a rejoinder, Your Honor. Very short rejoinder. THE PRESIDING OFFICER. Please go ahead. REP. BARZAGA. As far as I can remember, when I was still in my law class, in the event that there is alleged insufficiency in the allegation of ultimate facts, the proper legal remedy would not be a motion to dismiss but a motion for a bill of particulars. That would be all, Your Honor. So what does Article II accuse the Chief Justice of doing? He is charged with accumulating ill-gotten wealth, wealth beyond his lawful means, plus graft and corruption. The prosecution in proving its charge, has every right to look for and present evidence that would support its charge –so any evidence it decides to seek, or present is what lawyers would call “relevant, material, and admissible.” After presenting their evidence, the Senators have to decide if the evidence proves that the Chief Justice committed what was alleged: that he accumulated ill-gotten wealth, failed to declare his properties, and committed graft and corruption. The Articles of Impeachment informed the Chief Justice of the charges against him –but obviously, the charges themselves do not have to prove the case. That is what a trial is for, with its presentation of evidence by both sides. The charges having been made, Senators have to vote on the ability –or lack of it– of the prosecution to prove their charges. As held in Far East Marble (Phils. ), Inc. v. Court of Appeals, a complaint is sufficient if it contains sufficient notice of the cause of action even though the allegations may be vague or indefinite, for, in such case, the recourse of the defendant is to file a motion for a bill of particulars. Pleadings should be liberally construed so that litigants can have ample opportunity to prove their claims and thus prevent a denial of justice due to legal technicalities. A complaint is sufficient if it contains sufficient notice of the cause of action even though the allegation may be vague or indefinite, for in such case, the recourse of the defendant would be to file a motion for a bill of particulars (Ramos vs. Condez, 20 SCRA 1146 ). It is indeed the better rule that, pleadings, as well as remedial laws, should be liberally construed so that the litigants may have ample opportunity to prove their respective claims so as to avoid possible denial of substantial justice due to legal technicalities (Adamo, et al. vs. Intermediate Appellate Court, et al., 191 SCRA 195 ). Here the Supreme Court seems to be saying, don’t be too technical about how things are worded, let the sides prove their positions in court. So, in sum, whichever way you look at it, the arguments of the defense can only serve to delay the proceedings. Or, put forward a view that lawyers might latch on to, for lack of familiarity with impeachment proceedings, based on the personal prestige of Justice Cuevas as someone who ought to know what he’s asserting. Though Justice Cuevas himself may know his assertions are, ultimately, weak, but hey, it’s worth a try. Another question that occurs to me is, does the Senate have discretion when it comes to the Articles of Impeachment? Meaning, can the Senate decide to eliminate certain charges? Consider the provisions of the Constitution: once the House sends up its Articles of Impeachment, trial is supposed to commence “forthwith” in the Senate –on the Articles of Impeachment. It’s potentially, a tricky question for the Senate President: he could rule, for example, that the defense makes a convincing case for throwing out all, or part, of Article II: and risk being overruled by the Senate, should a senator move to do so; or he could follow the precedents he already laid down at the start of the trial, by saying that just as he expects no one to question the Senate in the conduct of the trial, he did not presume to question the conduct of the House in approving and sending the Articles of Impeachment to the Senate. Useful links: There’s a daily digest of the proceedings in the impeachment trial in The Corona Impeachment in MBC.com; keenly following the proceedings are abogadomo.com, sassy lawyer, and Article VIII Jester, and ImpeachmentWatch. The scoops tend to be in Rappler.com –see their 5 things to expect in this week’s #CoronaTrial— and the blog of Raissa Robles. Backgrounders and briefers: The Articles of Impeachment; Chief Justice Renato Corona’s Reply to the Articles of Impeachment; Reply of the Prosecutors to the Chief Justice’s Reply; Impeachment: A Political and Historical Guide; Fast Facts; Summary of Impeachment Complaint; Timeline: The Embattled Chief Justice and Road to Impeachment; Corona’s SALN (2003-2011); Cast of Characters.